Common Snowberry is a small deciduous shrub with characteristic white to pink flowers and clusters of white fruit. This North American native species is very adaptable, and can be used for erosion control in riparian and restoration areas. Snowberry's fruit attracts wildlife, and livestock can consume the berries without issue. 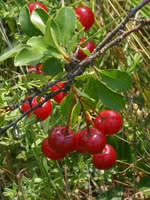 Mongolian Cherry is a hardy shrub that is often grown as an ornamental. This plant makes an attractive flowering hedgerow that requires little maintenance. The dark red cherries are tart and desirable for baking, wine-making, and canning. This shrub is popular with wildlife.